Alrighty, you all know how much I like adore bread. Anywho, I stumbled across some posts about a bread book and it of course they caught my eye. I thought about buying it right off the bat but well, what if I did not like it?! So, I off I went online to our local library and did a quick search to see if they had it and they did. I made the dough last night, let it sit overnight and shaped it this morning. Nice and crunchy on the outside and soft on the inside. 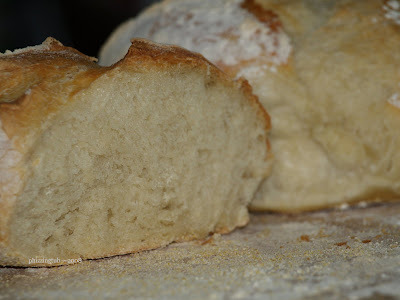 Seriously, lunch was a slice hunk of this yummy bread. The boys were thrilled with it and dh has requested that more be made later in the week and that I make it when we visit family for Christmas. It is that easy and the end results are well, mouthwatering. 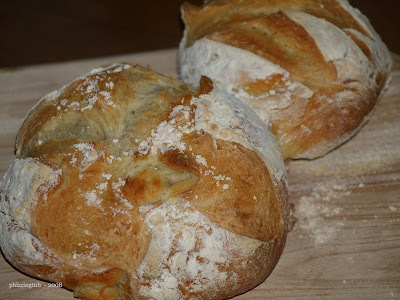 I highly recommend the book: Artisan Bread in Five Minutes a Day by Jeff Jertzberg and Zoe Francois. You know what is on my holiday list now *wink*! smells good even from here! I have been a baking fool since I found this recipe.